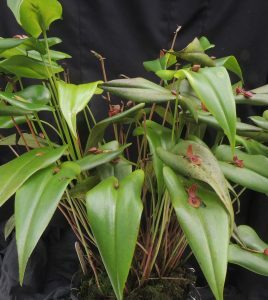 This is a medium to large sized Pleurothallis with 10cm heart shaped leaved on 20cm stems. The flowers are produced successively from the base of the leaf and sit neatly on top of the leaf. This plant is always in flower. 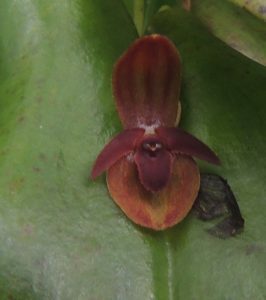 The species is endemic to Ecuador where it grows in wet forests from 1000 to 2500m and we keep the plant damp all year and well shaded in Cool Americas.